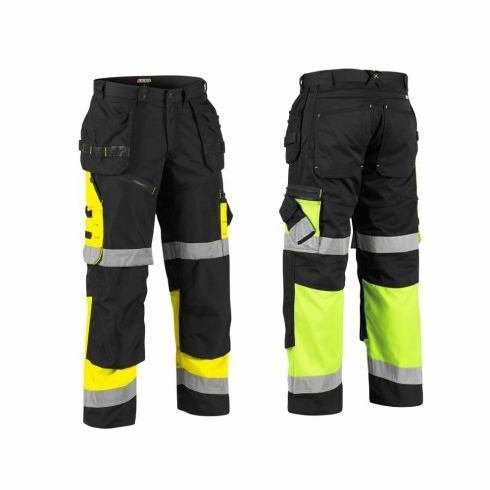 Blaklader HI-VIS X1600 Work PantsBlaklader, HI-VIS X1600 Work Pants at Environmental Safety Services for only $119.95 your CA. Distributor! The Blaklader X1600 provides highly durable, high visibility protection for the workplace. Designed to be both rigid and functional, the X1600 work pants are made from a tough poly-cotton twill blend (65% polyester, 35% cotton). They feature CORDURA reinforcement in the knee, lower thigh, utility pockets and other critical areas areas to provide resistance against tears, punctures and abrasion for a long lifespan. The durable, functional X1600 is now available in a safety pant. The CORDURA extends up onto the thigh for added protection. CORDURA utility pockets for strength and versatility. Level 2 3M reflective tape. Be Seen! ANSI/ISEA 107-2010 Class E. When Class E pants are worn with Performance Class 2 or Class 3 apparel, the overall classification for the ensamble shall be Performance Class 3. FABRIC...........65% polyester/35% cotton, 11 oz.